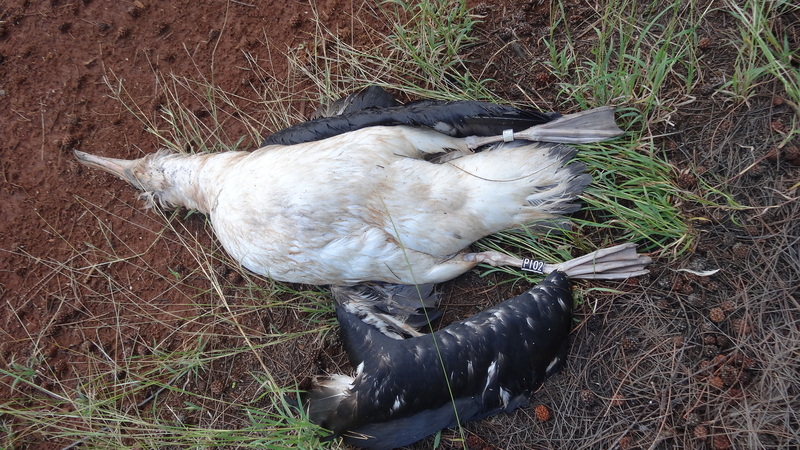 The Department of Land and Natural Resources is asking for the public‘s help in identifying the owner(s) of two dogs recently seen attacking ground-nesting Laysan albatrosses in Moloa’a, Kauai. They were photographed and the image is posted on fliers that are being distributed in the community, starting Friday. Since December, a string of albatross killings has been reported at two coastal properties on the northeast shores of Kauai. A total of 17 birds were found mauled to death at Moloaa by dogs this season. 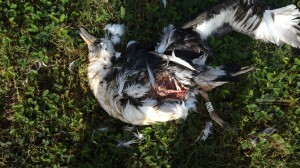 The total number of albatross killed on Kauai this season is 26 birds. The other deaths (9 birds) are from another property nearby. 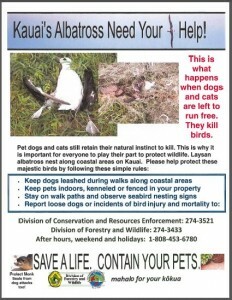 Any person with who recognizes the dogs or knows who the dogs’ owners are, is asked to please call the DLNR Division of Forestry and Wildlife at 274-3521 or 274-3433. After hours, weekends and holidays, please call the Division of Conservation and Resources Enforcement (DOCARE) Hotline at 1-808-453-6780. Please help protect Kauai’s seabirds by keeping your pet dogs on leash or kenneled. Stay on walking paths and observe seabird nesting signs.